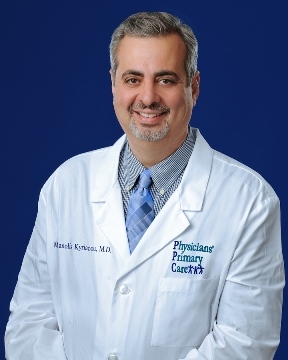 FORT MYERS, Fla. - April 30, 2018 - PRLog -- Dr. Manolis Kyriacou has joined Physicians' Primary Care of Southwest Florida as a family medicine physician. Dr. Kyriacou has more than 10 years experience as a primary care physician in Michigan, where he also served as an assistant professor of family medicine at Oakland University William Beaumont School of Medicine.and as medical director of the Wilmar Convalescent Center in Utica, Mich.
Dr. Kyriacou earned his Doctor of Medicine degree from the Spartan Health Science University in the West Indies. His residency was completed at Bon Secours Cottage Health Services in Grosse Pointe, Mich.
Dr. Kyriacou will see patients at the Cape Coral Family Medicine office at 1255 Viscaya Parkway. Physicians' Primary Care of Southwest Florida, a physician-owned and operated medical practice, was formed in 1996 by many local physicians and has grown to become the largest independent multi-specialty primary care practice in Southwest Florida.